Although drumsticks are the most popular tools used for playing drums, percussionists also have the option of playing the drums with drum brushes. A drum brush is a musical tool made out of a bunch of thin wire that creates a swish sound when struck against a drum. The brush produces a softer sound that may be more suitable for certain genres of music than a harsh drumstick. If you do not have a drum brush, but wish to try out the sound of one, consider making a drum brush yourself. Take the bunch of 20 metal wire strands. Cut them down to approximately 8 inches with the wire cutters. Make sure they are all the same exact length, or else the brush will not produce a balanced sound on the drums. Secure one end of the bunch with two rubber bands. Wrap one rubber band at the very bottom of the strands and a second one about 1 inch up. Make sure the rubber bands are tight, as they must keep the wire bunch in place. Wrap duct tape around the bottom 2 inches of the wire bunch. The duct tape serves as the handle for the drum brush, so it must be made thick. Wrap the duct tape around 10 or more times to create a thicker handle that is comfortable to hold. Cut the duct tape with scissors to finish the roll. The drummer will hold the drum brush by the duct tape handle, in order to touch the wire bristles to the drums. You can embellish the drum brush by painting the duct tape handle black, or another color that will coat well over the silver duct tape. 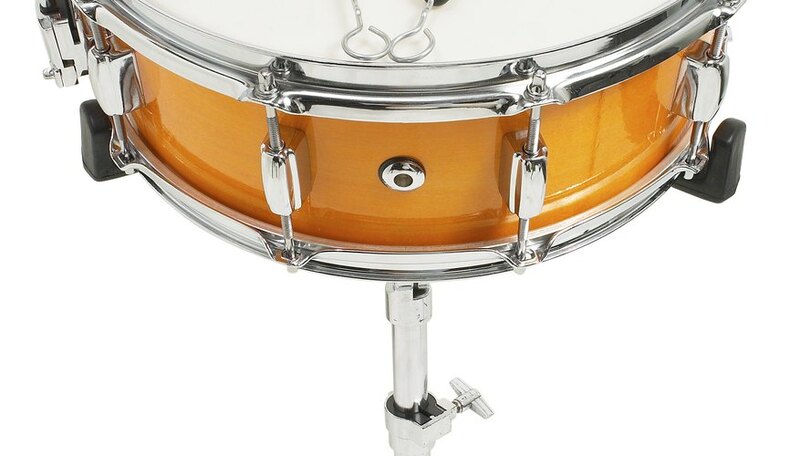 You can also give your drum brush a unique look by using colored wire instead of regular grey or silver wire.